Hamsun, as I have often said, is one of the authors who vitally affected me as writer . (Henry Miller: The Books In My Life, 1952). The first published book by Jean Rhys appeared when she was in her thirties, her collection entitled The Left Bank (1927). It contains a grim little sketch (stark self-portrait rather than short story) called Hunger. In 1890, the year of Jean's birth, an unknown Norwegian writer had published his first book. 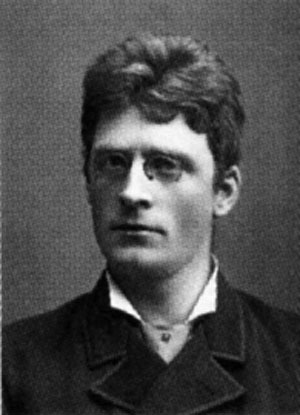 Knut Hamsun was then in his thirties too and his extraordinary novel was called Hunger. The earlier book describes the sufferings and stubborn endurance of a starving would be writer as he wanders around the bleak, townscape of Kristiania (Oslo). This unnamed but blazingly honest narrator encounters mental and physical coldness everywhere. In search naturally of himself - via any friendly face or halfway responsive editor -yet increasingly desperate to earn a literary or actual crust, he meets with ridicule, distrust, contempt or incomprehension. The result is an anguished if aggressive tragicomedy, a lonely plea for survival in a cold zone of the spirit. Here the getting of a living, one's daily bread, and the meaning of a life are all called into question, with an individual's persistence and self-belief coming under attack from the inhumane and mostly beastly bourgeoisie. But the bitter wit precludes self-pity. The protagonist's tone of rueful intimacy sounds a new note. It's a voice of unusual candour which ensures that we trust the teller through the tale. In this original, very personal voice, surviving time and translators alike, Hamsun manages a miraculous transformation, whereby extreme or depressing experiences become something of a joyous assertion against the worst odds. Down but not out, bloodied by the bloody awfulness of life, but unbowed, individual authors find themselves hungering always for the spirit that gives life, the word that goes beyond flesh and sustains both life and letters. It's a pioneering and properly inspiriting book still. Over the years, that resilient hungry narrator singlemindedly, singlehandedly fighting off urban angst and avarice, wholly in search of existential meaning or a more meaningful existence, has had a multiplicity of influences: similarities and parallels may be traced from Hamsun through to Joyce, Celine, Miller and many of the heroes and villains of Modernism. Hunger has certain qualities, however, which particularly remind me of Jean's Paris-based works. There's the blend of bleak realism and imaginative fancy (or fanciful imagination), and within the narrative the artful contrast and interplay of these polarities. The framework (since the 'plot' as such is minimal) is both lucidly detached yet very taut; it seems so freewheeling, so loose, yet it's highly controlled. The tone of voice is intimately personal, but remains understated, while not actually giving the impression of reticence in its selection of detail. And whether modulating from a whisper to a scream, that voice insinuates, takes you into its confidence and weaves its spell so that you listen, riveted. Included in the work - the same applies to Jean's books - are dreams, hallucinations, omens, fetishes of varying kinds, premonitions. These pointers towards the unconscious; literary-psychological signposts; fantasies, obsessions - whatever they are, are seamlessly, unerringly deployed. And yet the mysterious buttonholing process of the narration has been glassily objective all the way, as the reader comes to realise in the end. Jean (In a 1934 letter to an American friend, the novelist Evelyn Scott), discusses various related problems: drink, the difficulties of paying the rent and, of course, writing. Last week I spent most of my time in bed. She doesn't explain why - February cold, booze, poverty, depression, convenience or pleasure? - but continues: Read Hunger by Knut Hamsun that gave me a great kick. Translated 1899 and might have been written yesterday. Jean has read the first, and at that time the only available, English translation. (By 'George Egerton' - pen name of early feminist author Mary Chavelita Dunne). it goes to show that a great author remains great, or retains some of the greatness, even in a mangled and inaccurate translation. This is also true, alas, of the edition I knew, the 1967 version of Hunger (the next into English) by the American poet Robert Bly. Nonetheless, as a young man early on in his writing life, I found the book unputdownable: a courageous, concise, emotional experience, Inspiring and inspired. There was a sardonic immediacy, a timeless quality about It, and that strange, distanced sense of intimacy I was to discover in Jean's own books. The leap of seventy years had resulted in a new book, even more moving and modern. Now, thirty years further on - Jean long dead and myself no longer a young man reading a young man's book. I've acquired the third English version of this masterpiece, and by it again am amused and moved. Sverre Lyngstad's new translation (Canongate, 1996), appropriately Scandinavian, catches the tense-changes, the pace and the staccato rhythms his precursors missed. There's no bogus romanticism here: it's true as ever, and as affecting. I wish Jean could have read this more accurate and hard-edged vision of all artistic apprenticeships. I wish I could have talked about it with her: I should have guessed she loved the book as I did. At any rate, this latest and best of versions of the unsinkable 'hunger artist' made me return to Jean's own Hunger. "It doesn't matter. I am not hungry either: that's a good thing as there is not the slightest prospect of my having anything to eat ..." "Starvation - or rather semi-starvation - coffee in the morning, bread at midday, is exactly like everything else. It has its compensations, but they do not come at once... To begin with it is a frankly awful business." "No money: nothing to eat Nothing I... But that's farcical. There must be something one can do. Full of practical common sense you rush about; you search for the elusive 'something'. At night you have long dreams about food." "On the second day you have a bad headache. You feel pugnacious. You argue all day with an invisible and sceptical listener." "Lying in bed, my arm over my eyes, I despise, utterly, my futile struggles of the last two years. What on earth have I been making such a fuss about? What does it matter, anyway? Women are always ridiculous when they struggle. It is like being suspended over a precipice. You cling for dear life with people walking on your fingers. Women do not only walk they stamp. She writes too, of "nerves strung tight. Like violin strings. Anything: lovely words, or the sound of a concertina from the street: even a badly played piano can make one cry. Not with hunger or sadness. No! But with the extraordinary beauty of life." Jean, like the mystics, like Hamsun in his greatest book, knew what was truly valuable, what was not. How does one fulfill oneself or fully express what one believes? How except through art, the great consoler, can one make sense of life or share insights into its meaning? "Ah, but has he starved'?" Gissing used to ask, whenever any writer's name would be mentioned. Gissing himself quite literally had, of course, and he knew how to cut through romantic affectation: there were no short cuts, ever, nor 'overnight successes' and other such unlikely stories. There is naturally a sort of morality of apprenticeship involved here. (Jazz musicians will ask "Has he paid his dues?" which boils down to the same.) Gissing perceived all this too, in New Grub Street, a novel Jean and I once agreed should be required reading for every tyro writer. In 1893 Gissing wrote to his brother: "The struggle of life gets harder as one goes on, instead of being lightened. It would be a strange sensation to look forward with easy confidence for a year or two." Gissing in his short life more or less burnt himself out - overworked, underpaid. But in his lifetime he was valued by his peers, as Jean was, and he too will surely continue to gain not mere readers but devotees. As for 'easy confidence', I doubt whether genuine writers experience much of that. But they may well read, and be read so, as though that's a magical quality they always did possess. At any rate, the unsettling creative hunger (being thirsty for experience, greedy for knowledge...) never leaves an artist. Jean, however old and tired she became, never lost it. Everyone knows that drinking too much inevitably involves eating too little. Under the circumstances, and until the very end, it was Jean's stamina rather than her gait that staggered. I never saw her too much the worse for wear. Anyhow, whenever visiting, I'd generally make sure of bringing along something for us to eat on that occasion. Sometimes we'd eat there with her, or we'd take her out to lunch or tea, or the affable Mr Greenslade would drive her to a prearranged pub or hotel at a halfway point between Axminster and Cheriton. But in truth, the food was of little importance: somehow or other, we were surviving; the company was what mattered. As for the famished Jean familiar to Stella Bowen and Ford Madox Ford, hungry for literary success and a meaningful life in the Paris of the 1920s, here's how she closed those early pages of her own Hunger: "I have never gone without food for longer than five days, so I cannot amuse you any longer". That's telling 'em! And telling it like it is, too... I want to cheer her - raise a glass to her brave ghost.